The fuel depot area stretches from normanton park to somewhere just behind Alexander Hospital with railway tracks passing through the depot then onto Tanjong Pegar railway station then. Nothing could be seen today behind the hospital grounds except the tracks where the railway once been. Some pictures of what remains of yhe railway tracks today. I grew up in the area – my parents rented a walk-up apartment in former military barracks (I think it was called Gloucester Barracks) behind Normanton Park. We had to go through a military sentry post to get home. After Normanton Park was completed, we moved across Ayer Rajah Rd (now the AYE) to Jalan Hang Jebat. I remember playing close to the disused oil tanks behind JHJ, amidst overgrown foliage and forever on the lookout for snakes. Next to JHB was the Gloucester playing fields where I played soccer with the neighbourhood kids (including the daughters of the then-operator of Colbar). I had friends in Normanton Park too – so I often got invited to swim in the pool there. When I did NS, I realised my childhood friend’s father was BG Colin Theseira. 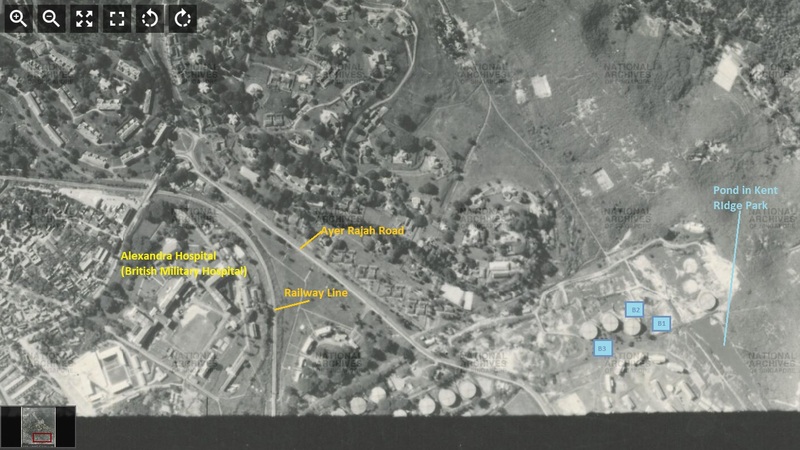 The oil depot actually stretched across to where Normanton Park and Kent Ridge Park is today – it was a massive tank farm. You will see that in old maps and aerial photos. Btw BMH was only completed in 1940. Aerial photograph of the Normanton Depot Area in 1953 (source: NAS).